This is now a tradition when I go to events sponsored by vendors where they give me branded schwag. You can read about why I do this here, and look at the full set of disclosure posts here. This disclosure post covers the period from Sunday 31 Jan to Saturday 6 Feb for Tech Field Day 10 and TECH.unplugged. 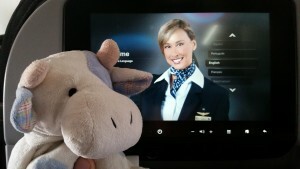 Blue Cow always watches the safety demonstration. My flights to and from Austin, TX (On Qantas and American Airlines) were paid for by Tech Field Day. My accommodation at the hotel was also paid for by Tech Field Day. I paid for my own sundry expenses during the journey, such as a Bloody Mary at LAX while I waited for my connecting flight to Austin. When I say mine, this is a work thing, so these are corporate expenses that my company pays for. Truly personal expenses I keep separate because accounting for Fringe Benefits Tax is a pain, so I try to keep it simple for my own sanity. I am very grateful to Stephen, Tom, and Claire from GestaltIT, and Ben and the Prime Image Media crew for consistently putting on excellent events and always making me feel welcome. 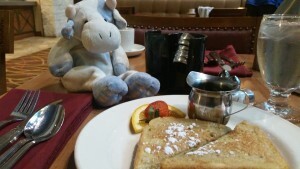 Blue Cow thinks French toast is overrated. On my way to Austin on Sunday morning, I had breakfast at Melbourne Airport: my last decent coffee for a while (which wasn’t that great, to be honest) and a pretty ordinary ham and cheese croissant. I paid for these myself. Airline food on the way over. Lunch on Sunday was a Bloody Mary and a bacon (billed as prosciutto, but it was more like proper bacon) and egg roll at LAX, which I paid for. It was a pretty good Bloody Mary, I must say. Before dinner, I had a beer at the hotel bar. Some sort of local dark ale, which tasted a little bit watery, to be honest. We were a little bit limited in choices because the beer people hadn’t been to restock, so they’d run out of pretty much everything else. Dinner was at Torchy’s Tacos in Austin at the one I’m pretty sure is on South 1st Street. I had a Democrat, which was delicious, and the red salsa was a particular standout for me. Paid for by Tech Field Day. Breakfast was at the hotel restaurant, paid for by myself. I had a big one, since the buffet option is relatively expensive, but I planned to skip lunch and work, so a hearty breakfast would get me through until dinner. Lunch was coffee in my room as I caught up on email and tweaked my presentation for the next day. Dinner on Monday was the TECH.unplugged speaker dinner, paid for by TECH.unplugged. I had a steak, because Texas, and a couple of dirty martinis. Claire Chaplais from GelstaltIT stole my olives, but they only gave me two, which is apparently bad luck. Breakfast on Tuesday was coffee at the TECH.unplugged venue. I was due to speak first, and I don’t like to eat much before going on, due to nerves. You can see the results here. Tuesday lunch was supplied by TECH.unplugged at the venue, as were some warm pretzels as a snack. Warm, knotted breadsticks with seeded mustard isn’t really my thing, I discovered. Tuesday evening was #storageBeers, sponsored by various companies including Rubrik and SolidFire/Netapp, and then the Tech Field Day dinner at the Omni hotel restaurant. I had steak again, and a couple of gin and tonics. Wednesday breakfast was supplied by Tech Field Day as we did the delegate briefing breakfast thing about what was coming up, get our mics from Prime Image Media, and other prep/logistics things that go on behind the scenes. I had eggs, sausage, a small pastry, and what passes for coffee at hotels. Lunch was Thai food at Caringo’s offices and it was tasty. I had Pad Thai and some Massaman curry and a diet Coke. Dr Pepper sightings so far: 0; consumed: 0. Post-lunch dessert was home made cookies, created by Caringo’s Sarah Cook. They were evilly delicious and my attempts at restraint failed miserably with the continued presence of the aforementioned daemon cookies. Dinner on Wednesday was at an (ex-) massage parlour (yes, that kind of massage parlour) called Midnight Cowboy, paid for by Tech Field Day. There was pizza and nibbles, such as the ever-present corn chips and queso. I’m more of salsa fan, as the warm cheese fondue thing just doesn’t really work for me. I tried the special cocktail thing the venue had made for the night, but it was heavy on the bourbon, of which I am not a big fan, so instead I drank several somethings named after a literary pun, so I’m basically a hipster now. Second dinner was at Kerbey Lane Cafe at 10pm. Yes, second dinner. I guess because Stephen was hungry, so we stopped at Kerbey Lane on the way back to the hotel. I had Migas, because Austin, and it was as tasty as the last time I ate at Kerbey Lane a couple of years ago. Claire and I had mimosas because that’s apparently something Americans do over breakfast. Breakfast Thursday was breakfast tacos at Dell. I’ve had breakfast tacos several times now, and they’re probably quite nice when fresh, but when they’ve been sitting for a little while in bags and have gotten cold, they’re not quite as nice. Chili can only do so much to enliven congealed eggs. Lunch was TexMex, supplied by Dell, from somewhere reasonably famous but which I can’t recall the name of [update: I was reminded by @Lost_Signal on Twitter that it was Chuy’s]. Build your own tacos type thing, and it was very tasty. We headed back to the Roundagon Hilton for afternoon presentations, and there were snacks. I had a half-handful of M&Ms and a diet Coke, from memory. Dinner was at the Alamo Drafthouse cinema in downtown Austin. This is a great venue that I’ve been to at least three times now, and it’s consistently good. I had a Royale with Cheese burger and fries, because America, and it was delicious. Friday. Last day. I traded a proper breakfast for an extra hour of sleep, which was an excellent trade. Breakfast was Nacho Cheese Doritos and a diet Coke, like a true American champion. At SolarWinds there were some snacks, and I had a diet Dr Pepper (my first for the trip!) and a long biscotti that had been dipped in dark chocolate along the bottom edge. Lunch was at SolarWinds, and was Texas BBQ, though I don’t recall which one it was this time. It was an excellent festival of meat, and I had seconds because I was due to fly out that night and didn’t plan on eating again until I was on the plane. I washed it down with another diet Dr Pepper, because yum, and then indulged in a slice of apple pie which was really good. I’m not usually a big fan of apple pie, but this one was excellent. And then it was plane food all the way home. NetApp closed their acquisition of SolidFire on Tuesday 2 Feb, and announced it during their TECH.unplugged session, which I just happened to be in. SolidFire gave me a pair of their new socks v3.0, which I wrote about at the end of my article in Forbes, accidentally breaking embargo, which I don’t like to do for companies that don’t deserve it, but embargoes are a complex thing, and the announcement was made in a public forum and the socks are a marketing device anyway. But yay, socks. I continue to enjoy a Platform9 complementary subscription, which I hope to get back to so I can test out some of the new features, when I can find some more lab time. A very nice fleece jacket with subtle Platform9 branding, which will come in handy during the Melbourne winter. I’ve received a demo VM version of Caringo to test out in my lab, which I managed to get running after fixing my virtual network configuration. More on that in another post. Two Caringo branded stainless-steel cup things with both a twist-style and a pop-style bottle opener in the base. Two Caringo branded coasters. They’re a kind of absorbent ceramic or something, with a cork base. A ribbon-cable style USB-C to Apple Lightning, mini-USB, and micro-USB adapter. A Dell branded car cigarette-lighter to USB converter. A Rubrik branded 2200 mAh USB power stick to add to my collection of power sticks. A Rubrik branded LEGO minifig with a brick made out to look like a Rubrik brik. Pun overload! A bobblehead that supposedly looks like me, but has hair (for some reason), and a small Rubrik logo on the figure’s hoodie, and the base says “Justin Warren, TFD 10”. Some Rubrik logo stickers. I have put one on my laptop. Some other items, on which more below. A Sphero Star Wards BB-8 droid toy. It’s nifty, and very cute. It uses Bluetooth on your phone (or tablet) to drive it around, and the sound-effects play on your phone which is shame (I’d prefer if the droid had a speaker) but the movements are cool. It has quite a lot of potential with some additions to the software. I believe they’re reasonably hackable, so I’ll have to give it a go if I can get it back from my son. Two t-shirts, one that says ““Help me SysAdmin, you’re my only hope,” and one that says “These are not the OIDs you’re looking for.” They have a discreet SolarWinds logo at the back of the neck. They’re quite comfy. They are from this set. A pair of New Balance shoes, in SolarWinds grey and orange, with my Twitter handle stitched into the heel as @jp on the left one, and warren on the right. We all received a pair with our respective Twitter handles. A SolarWinds branded canvas shopping bag. Chris Wahl deliberately gamed the system by getting me a bunch of stuff (and only me, other delegates didn’t get this stuff) so that I would be forced to write about it. Ten points to Gryffindor for pushing the boundaries with edge case testing. However, just because I pretty much have to write about it (because precedent) doesn’t mean Chris gets a say in how I write about it. A peaked cap with the word MURICA emblazoned on the front with American flag infill to the text. The cap itself is in the French Tricolore for some reason I assume makes sense to Americans. The French did give them a statue, I suppose. A bum bag, called a fanny pack by Americans, which the English and Australians alike find endlessly hilarious because regional slang is a funny thing indeed. This one is bright pink with the word PARTY in bright green Impact style typeface. 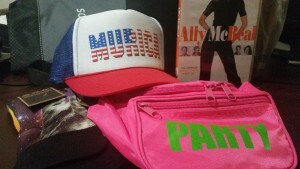 A fanny pack party. *snerk*. Silly Putty. The Original. And, I assume, best. I’m not clear on what sort of party Chris normally enjoys, but these subtle clues are starting to paint an alarming picture. A USD$5 gift card to TVStoreOnline.com. That’s nearly AUD$7.15 at current exchange rates, which is still not enough to afford a Borat Mankini even when it’s on special, so I’m not sure on what I’m supposed to wear to this disturbing party Chris has planned. Two pairs of 100% Polyester Function Socks (“We put the Fun in Function.” How droll!) One pair shows a laser space cat, and the other is a cat surfing on a piece of pizza. While funny cat pictures do indeed underpin the functioning of the Internet, are you not slightly disturbed that Chris a) knew of the existence of these socks, b) was moved to purchase them, and c) was comfortable making both of these facts known to the world at large? Is this a cry for help? Ally McBeal, The Complete Second Season 6-Disc Set. I assume this is from Chris’s personal collection, so I am humbled that he could part with something that is clearly so special to him. Photographic evidence of me wearing some of this gear is rumoured to exist, but are you one to believe in idle gossip? And thus we conclude this latest adventure in corporate largesse and influence peddling. Did it work? Only you can tell.